Despite the extravagant names and the “werewolf hunter” tagline, Ward seems to approach everything he does in a scientific manner and distances himself from a pop culture-fanboy image. “Everything we investigate is possible and, in some form, known to science,” he insists. Only after spending considerable effort verifying the claims of a sighting do the Hellhunters go into the field. The verification process includes enquiring as to whether the caller has watched any cryptozoological documentaries recently – this would make the individual’s claim less likely to be a real sighting and more likely to be the result of an overexcited mind – and researching the site’s history. 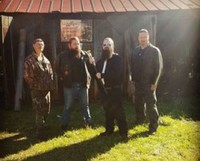 If everything seems to check out and the source is fairly local to the team’s home in Alabama, the Hellhunters move in. Upon arrival at a sighting location, the team splits and assumes their pre-assigned roles. Some members question locals, while others set up the equipment they will use to find and track whatever critter appears: This includes sensors, radios and night vision cameras, as well as microscopes for analyzing evidence. Another group, the “tracking team,” follows trails and footprints in an effort to locate the beast. This doesn’t happen all that often because many of the calls they receive turn out to be cases of mistaken identity or straight-up hoaxes. “Even of the sightings that seem credible, the majority turn out to have a pretty mundane explanation,” Ward adds. Cryptozoology is a much-debated practice. However, it seems that, despite the exaggerated names and online shop selling silver bullets, Ward and his crew take their work very seriously and head into any situation fully expecting to find a mundane explanation, rather than an actual werewolf, or other creature. There are real-life examples of mythical creatures being found by monster hunters which serve to validate what he does as an actual science. For instance, the legendary Kraken was “discovered” in 2004 when the first images of a giant squid were taken. A more tenuous mythical creature that could be based on a real-life animal is the thunderbird, as Ward explains: “Several Native American tribes have legends of what we tend to collectively call ‘thunderbirds’ – large, winged monsters that had supernatural overtones. In Arabic legend, the Roc was a giant bird that could carry off humans. All over the world, legends of dragon-like monsters flood the subconscious mind of societies and hint at something evil lost to the mists of time. Theories abound as to what causes these legends to be so prevalent around the world. One thing we do know is that these ‘monsters’ could exist,” he continues. “Unlike some cryptids, we can see almost exactly what a thunderbird would have looked like by going to a museum of natural history. Just check out the pterosaurs, like the amazing quetzalcoatlus with a wingspan of up to 40 feet. Seeing that in the sky would have most likely caused terror and awe that would have become a tale told around many a campfire.” It seems tenuous that a descendant of the pterosaurs – made famous by Jurassic Park – may have been seen by prehistoric humans. However, Ward cites the case of the presumed extinct coelacanth, the “missing link” between fish and four-legged animals that was discovered in 1938, which could suggest that other prehistoric animals could survive unseen. However, it is probably considerably easier for a 6½-foot-long fish to hide in the depths of the ocean than for a bird with a wingspan the length of a bus to hide in the skies. It seems the point Ward is trying to make is that in high-pressure situations, people can mistake unknown or out-of-place creatures for monsters and he usually looks for the rational explanation. Fear can warp people’s minds and memories when they’ve seen something slightly out of the ordinary, which could account for some of the exaggerated tales that have been passed down through generations. “There are cases, however, that defy any mundane explanation,” he contends. One is the case of Dogwood. It started with strange sightings in the woods and some claw marks in the back of someone’s truck bed in the near-abandoned mining town. The evidence was sufficient enough for the Hellhunters to get involved. “After we contacted our lead, we discovered that almost the entire community had been seeing what they knew locally as the ‘rock dump monster.’ It fit the description of the ‘white thing’ or an albino ‘dogman’ [that had historically been sighted in the area]. “We did some interviews, and enough of the stories seemed to match that we took it seriously,” he explains. “We discovered a case in the area that had made national news. A pug was skinned alive by what the police and the vet first thought was some sick human individual.” Eventually, police decided it was the work of an animal. Other cases of skinned animals had cropped up in the area, suggesting serial attacks by whoever, or whatever, was doing it. However, when the Hellhunters set up camp to track the possible dogman, they failed to capture any footage of the creature. Ward claims his camera picked up a heat signature in an old mine shaft, but their path was blocked by a bridge too rusted to support their weight. On their way back to camp following this unsuccessful hunt to film the creature, he claims they saw three “somethings” ahead of them in the woods. Additionally, the tripwires at their camp were set off in the night. Unfortunately, the Hellhunters found nothing more than a footprint of unknown origin in the woods, which suggests they could have simply encountered a bear or some other native creature. Nevertheless, Ward is adamant the case remains unexplained and feels it was quite possibly a creature similar to the lofa of American Indian lore, a bigfoot- or ogre-type beast. Source: Ben Sledge, The Overtake, June 2, 2018. There have been werewolf sightings in several Southern states. In Kentucky, we have a werewolf like creature known as the "Bearilla." In 2005, there was a sighting in Eastern Kentucky, where I live. In Alabama, a she werewolf was seen several times in Mobile in the early 1970's.